With its higher-contrast yellow 100% rangefinder, the Leica II can be focused with both eyes open. It has no slow speeds, which mostly are unusable with a handheld camera. It is small, pocketable, its 1/500th top speed is enough to shoot 400 ASA film with the 'Sunny 16' approach. It lacks a selftimer too, and how often do you need one anyway? Of course, a huge array of excellent lenses is designed for the M-mount system and those cannot be used on the screw mount Leica that Oskar Barnack designed. But I have to admit that on a lot of occasions I get better results with an SLR than with an M-mount Leica and selling my M mount lenses freed up a lot of money that was invested in other camera gear, in film scanners, in film, in paper, and of course in more lenses. Lenses for the one LTM mount camera that I kept. 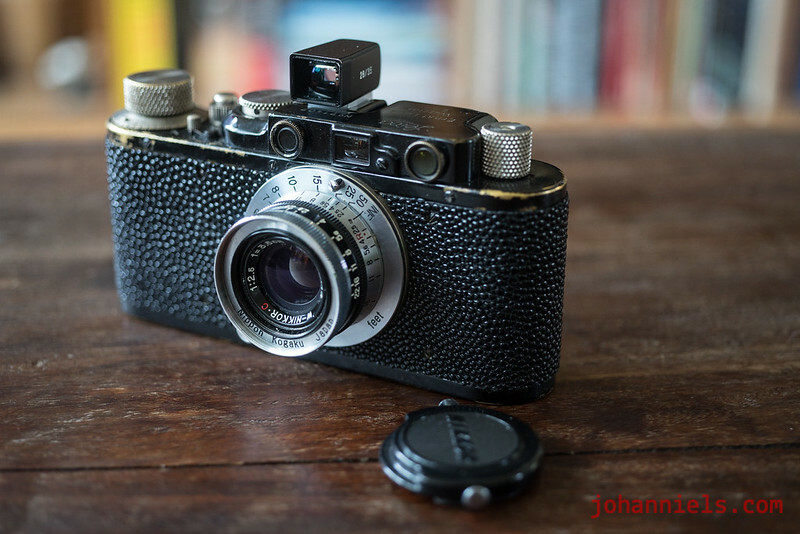 A Leica II from the very first batch, from February 1932. The 208th camera ever made. My Leica II is extra special to me, because the serial number is one digit away from my date of birth. So I thought it best to treat it right and that meant treat it to a full range of lenses. I'll introduce them to you. They all have their quality but they are from very different upbringings. And from different ages too. 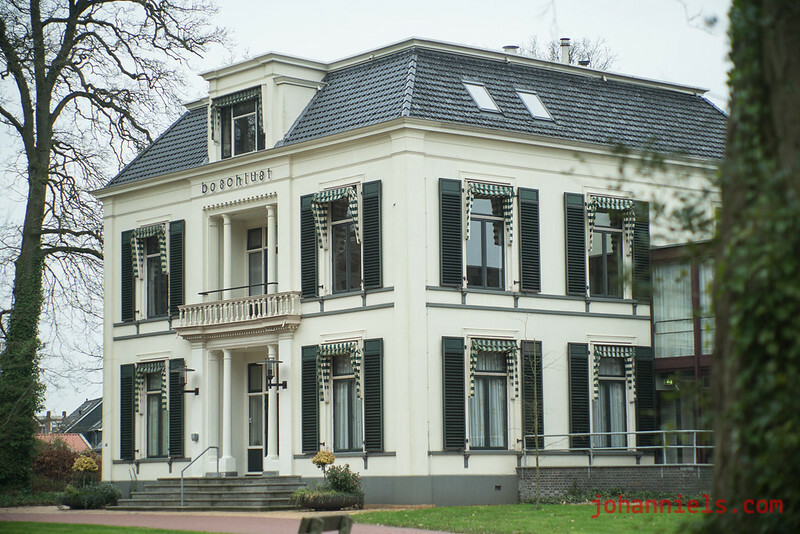 The Voigtländer Color-Skopar 21mm 4.0 is a lens from the turn of this century. It is made from aluminium and silver anodized. I use it with a 25mm lens hood until I will be able to find the (slightly shorter) 21mm lens hood for it. There is an Avenon 21mm 2.8 in LTM but it's expensive and very big. Also, it's a bit soft wide open and I don't need 2.8, I'm really fine with the 4.0 for shooting daytime cityscapes etcetera. The Angulon 21mm 4.0 in LTM is just too expensive for my taste and wallet. The Avenon 28mm 3.5 model II is the shortest lens I own for the Leica II. This lens was made in Japan, sold in Japan under the Avenon name but was also sold in the USA as Kobalux and in Europe as Pasoptik. The small Japanese company (YK Optical, Yokohama) that produced these also produced the before-mentioned 21mm 2.8 lens. Numbers are limited, production was stopped in 2002. This lens is the multi-coaed (MC) model II, with an eight-bladed aperture and a focus lever that is one-piece machined with the whole focus ring. For some reason my lens is blacked out at the front, the letters were never filled in with paint. Maybe it was a special order, or a factory sample. I like the all-black appearance of it so I kept it like this. There's not much to choose in the 28mm department either. I once owned a Komura 28mm 3.5 and while distortion was well-corrected, contrast very good for an early-1960s lens and handling was also great, although it lacked a focus tab. 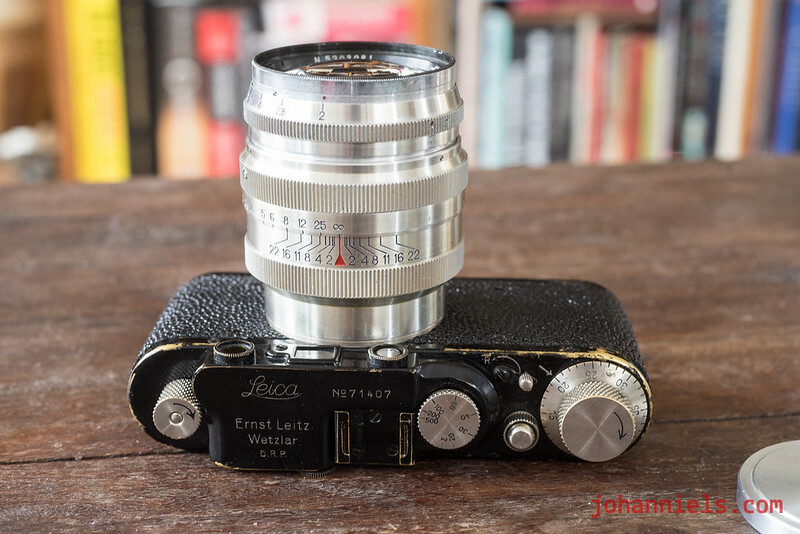 But, the 55mm filter size was a severe issue on the Leica II since it blocked part of the rangefinder. And prices have gone up in the last decade too. 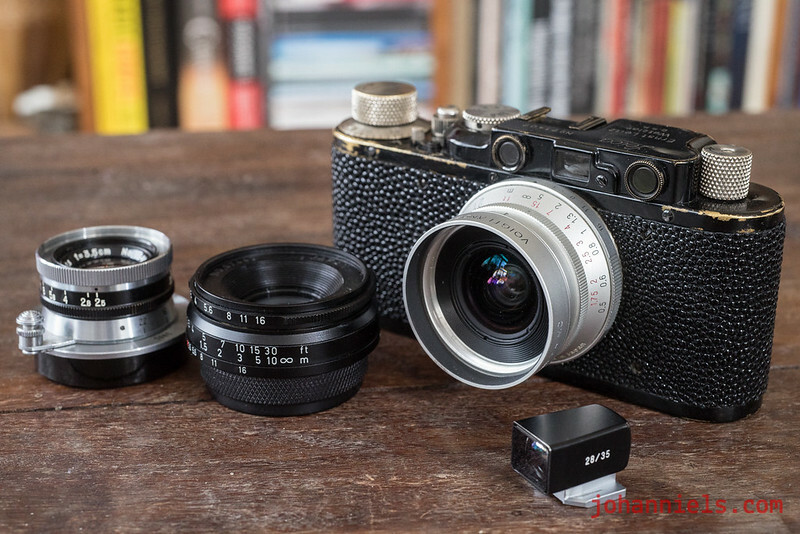 The Voigtländer 28mm 3.5 (I forgot the name) has rapidly become a collector's item and a loved shooter so expect to pay upward of USD 550 for a used one. The Canons (both the 2.8 and 3.5 version) have softer contrast and the 3.5 version slightly vignettes unless stopped down to 5.6 or so. I wanted a more modern-rendering lens and the Avenon is kind of forgotten. Contrast and handling are very nice, it looks good and the price is right too. 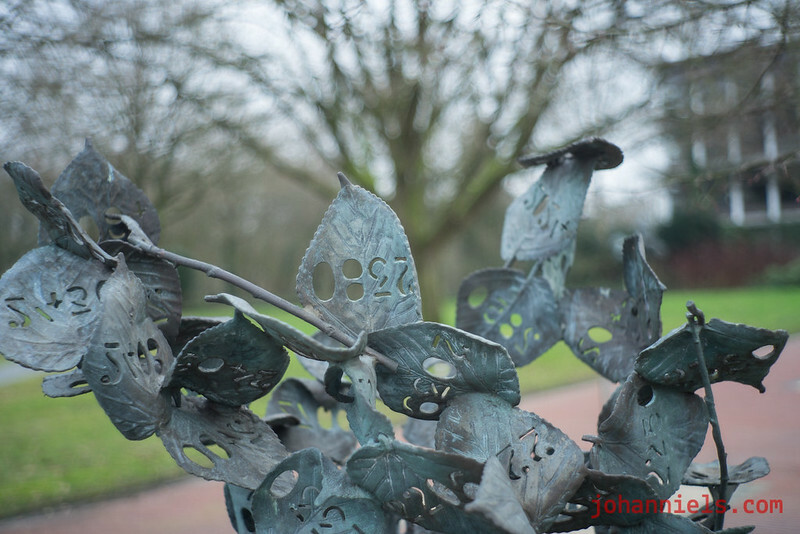 Also, the focus throw is very short, under 90º gets you from infinity to nearest focus. 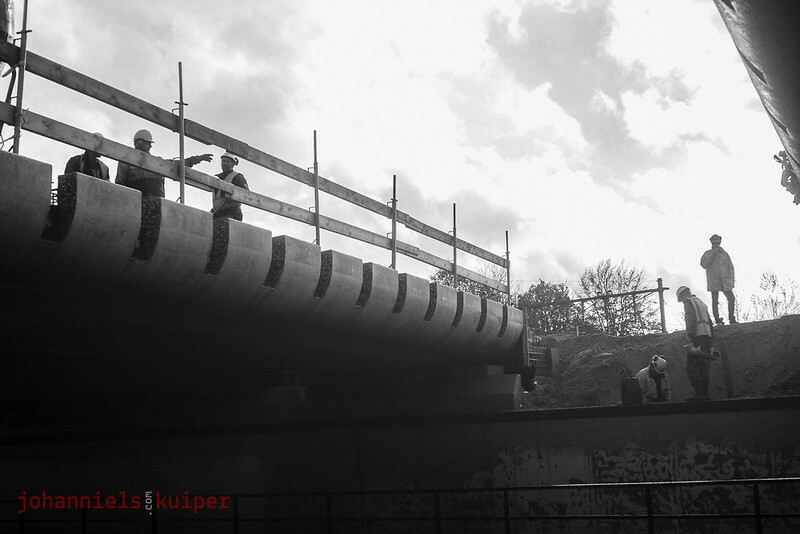 The 43.5mm filter is the same as the Olympus Trip 35 so filters can be found but I hardly ever need one. 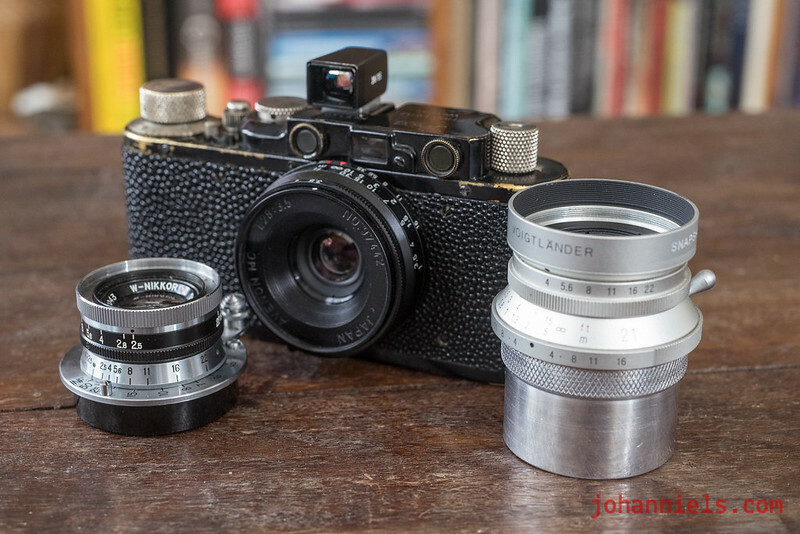 The bigger Voigtländer Ultron 28mm 1.9 kind of defeats the Leica II's biggest perk, it's size. Nippon Kogaku in the late 1940s and throughout the 1950s built Leica copies and also made their own lenses to go with them. Their lens brand was Nikkor. This company later on became the SLR and DSLR pioneer company Nikon, but back in the 1950s all that was still evolving. The company had impressed British war photographer David Douglas Duncan, who shot Nikkor lenses on a Leica IIIc during the Korean War and before too long, every photographer who was flying into Korea stopped over at Tokyo to get their own set of Nikkor lenses. 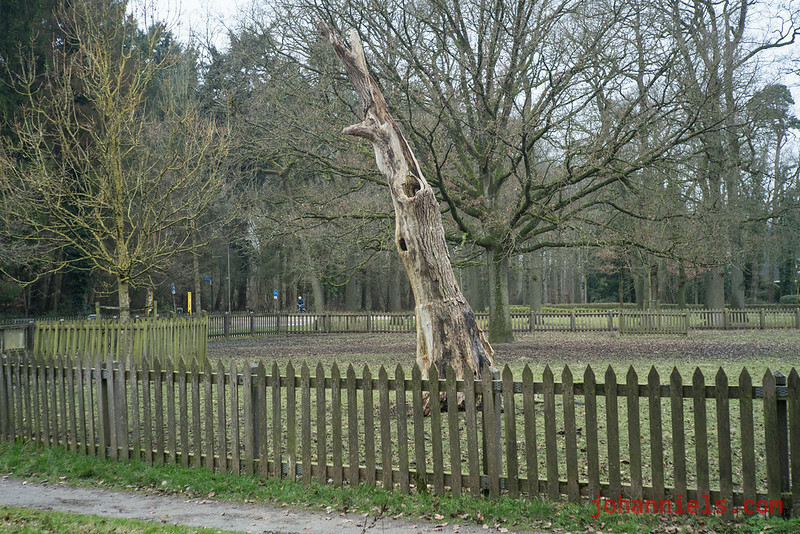 The Nikkor 35mm 2.5 is unbelievably small and sharp for such a small lens. It is just a fraction taller than the Avenon, but takes puny 34.5mm filters which are near impossible to find. In the past I shot a Canon 35mm 2.0 and while that is dubbed 'The Japanese Summicron' on the internet, I never fully got to grips with it. I missed the focus tab. 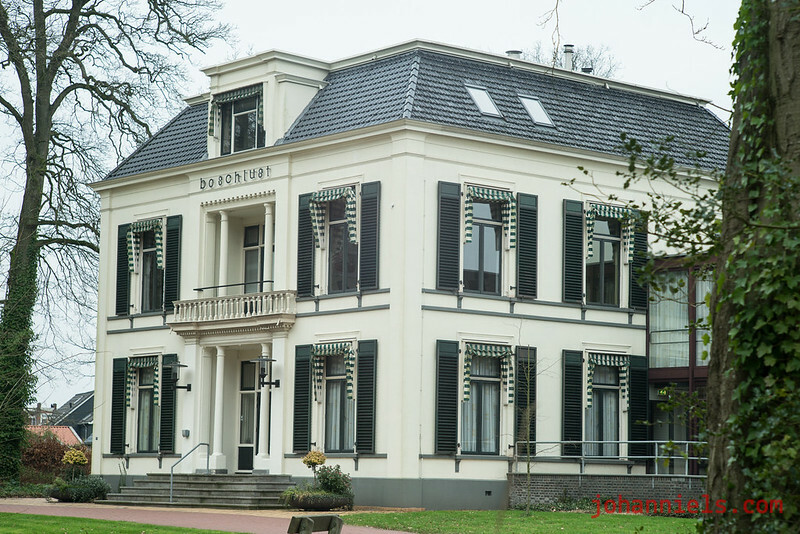 The older Canon 35mm 3.2 is from the same era as the 28mm 3.5 and 2.8 and also is lower in contrast. The Summarons are nice, except for their price. Especially the 2.8 convertible M/LTM version which would look awesome on this camera! is too expensive. Fifty millimeters being the standard lens for Leicas and other brands, rangefinders and SLRs alike, I own three favorite 50mm lenses. 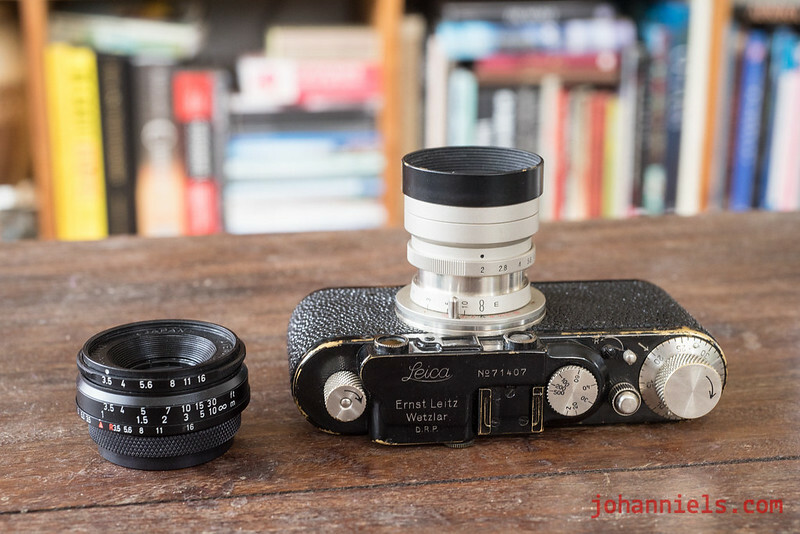 The 50mm 3.5 Elmar is the original lens to my Leica. It has a pre-1932 serial number, is plated in nickel, has an infinity stop that locks at 11 o'clock and is uncoated. 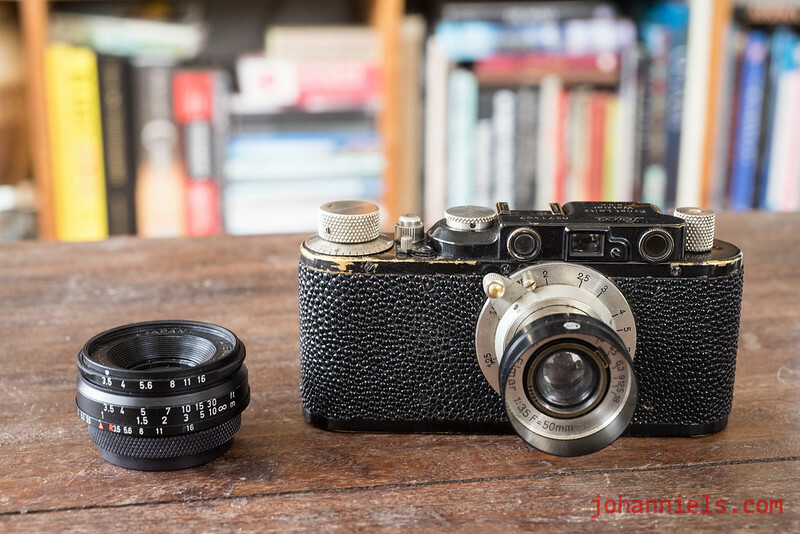 I shoot it with a small clip-on hood from the Janua, a rare Italian Leica copy camera. The lens hood of this rare copy was cheaper than a Leitz lens hood since nobody bid on it in an auction. Thanks a lot! 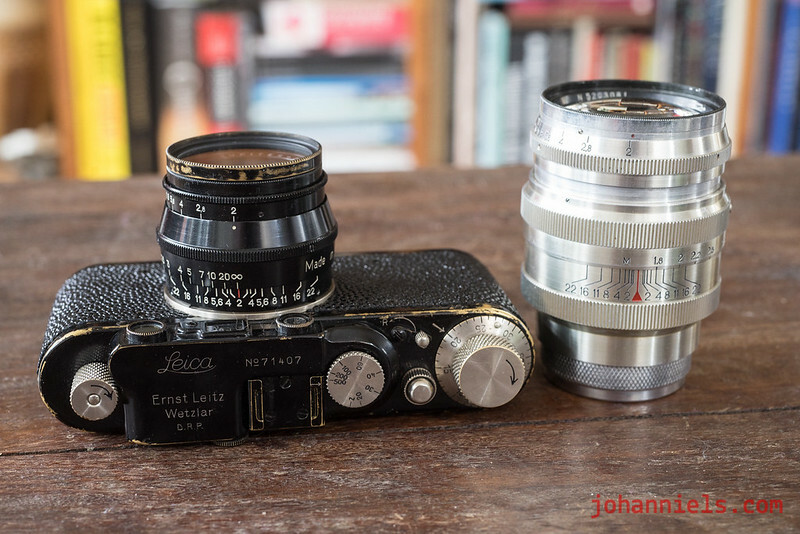 A five-digit Elmar 50mm 3.5 in nickel, a very early one and very likely the original lens to the 1932 early Leica II! 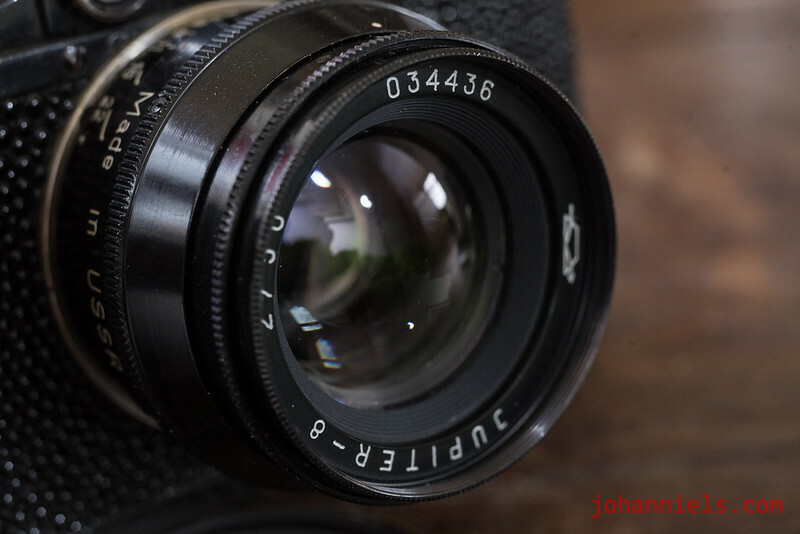 The Jupiter-8 50mm 2.0 is a lens that is often frowned upon. It is supposed to be not very good. Although the lens is a copy of the pre-war Carl Zeiss 50mm 2.0 Sonnar, it often was slapped together in Russian factories, where quality control in certain eras was almost non-existent. But, the series that my lens is from, was an attempt by Russian Manufacturer KMZ to improve on that reputation and as a result in 1993 they invested heavily in materials, quality control and marketing. The lens is shiny black, lettering isn't printed on anymore (remember those hideous green letters that rubbed off?) but engraved and very precise. Engravings are filled in off-white. Focus is smooth, the lens appears to be single-coated. It is marked 'Made in USSR', to signal it was designated for export. But in the end it did not make much of a difference. 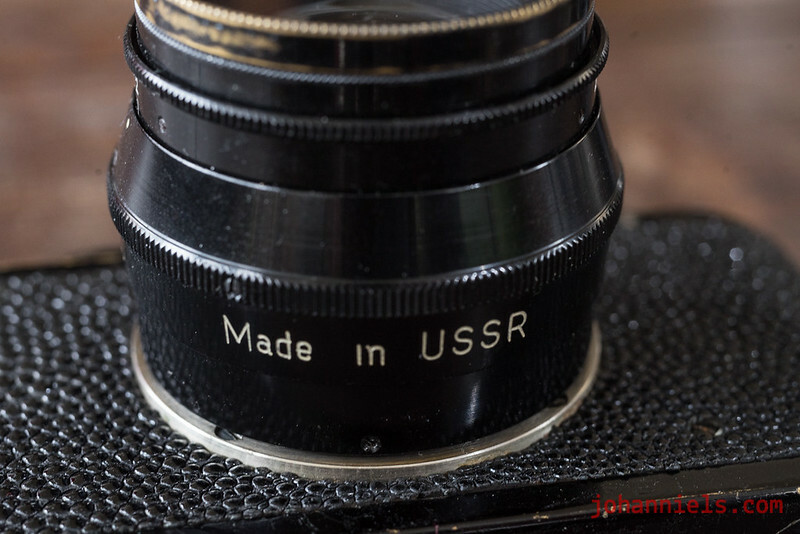 Shortly after, the USSR ended and the Jupiter's reputation never improved much so as a result, you can pick up these great quality lenses for not much more than the sloppy ones! Glossy black paint Jupiter-8 50mm 2.0 from the early 1990s. Very nice engravings, filled with white paint too! 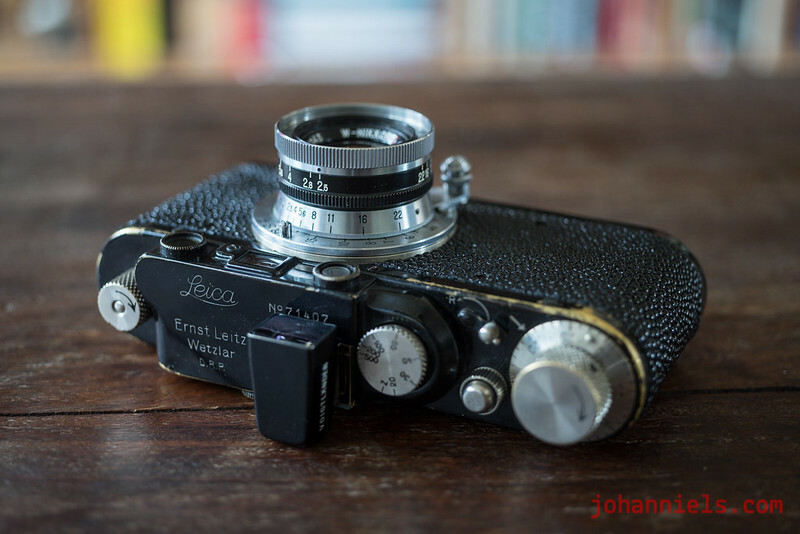 It matches the 1932 Leica II so nicely! Designated for export: bold engravings that proudly state 'Made in USSR'. The Jupiter-8 in action. Close up and @ 5.6. ... and shot wide open at closest focus. 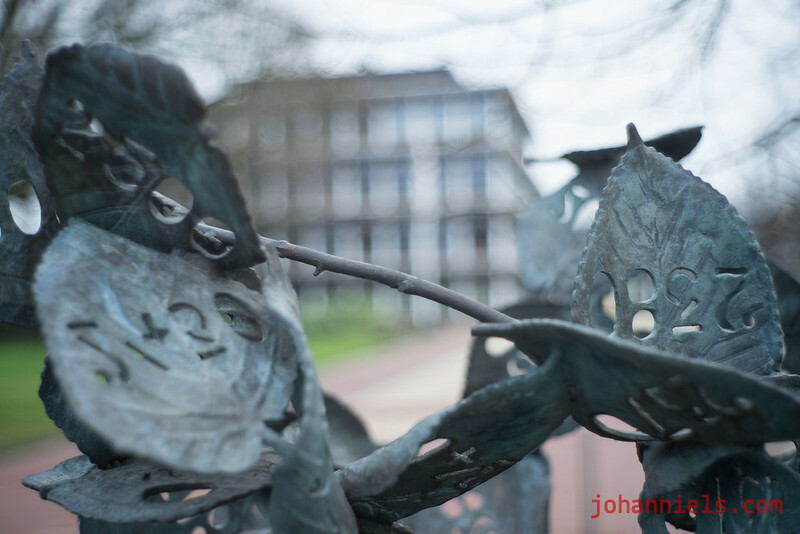 Again, @ 5.6 aperture but focused further away. A very sharp lens. 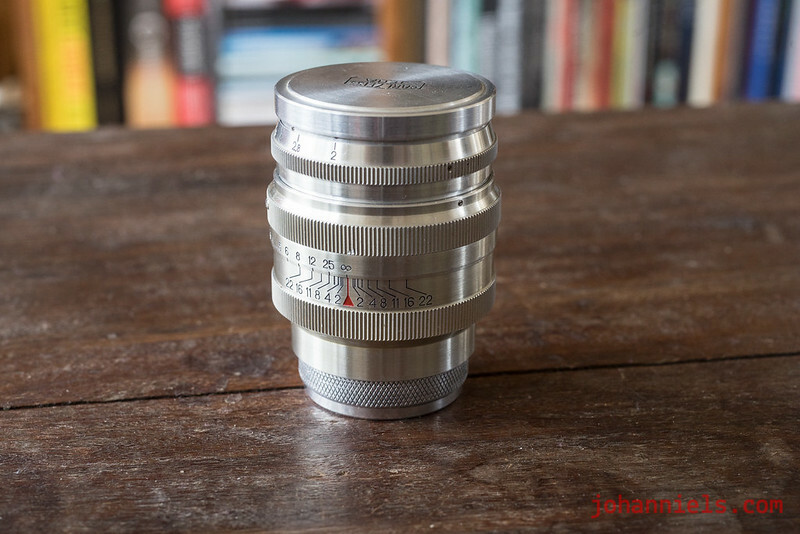 Third is a special lens, the Voigtländer Heliar 50mm 2.0 in nickel. This and it's twin brother the collapsible 50mm 3.5 Heliar are the only nickel lenses ever made for Barnack Leicas since the early 1930s! This lens has five elements in three groups, a 10-bladed aperture and weighs in at a hefty 191 grammes, being all brass and nickel plated. It is modelled after the (nowadays very collectable and hence expensive) Rigid Summar that Leitz made in the early 1930s. 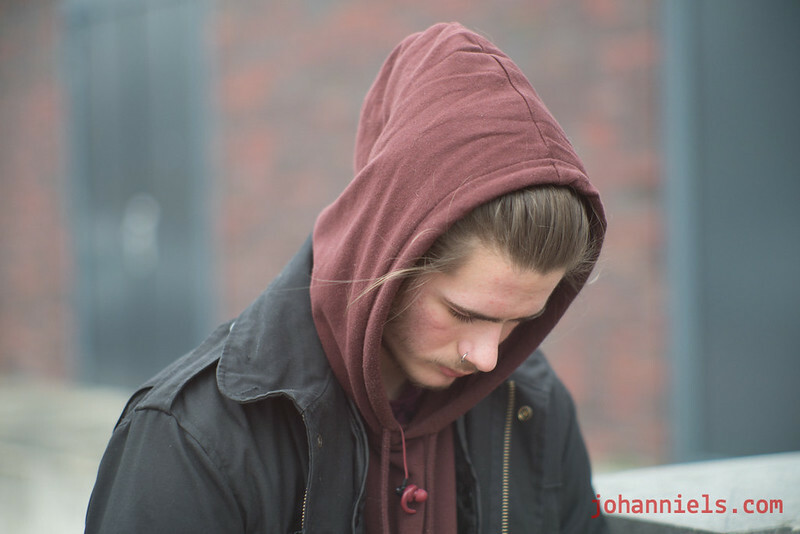 I keep those three 50mm lenses for a number of reasons. The nickel 11 o'clock uncoated Elmar is original to the camera and not keeping it would first of all almost be heresy, but I also greatly value it for its rendering. There's nothing like pre-war uncoated lenses, they get you that typical era-bound glow in black and white and render the best pastel-like colors with C41 and slide films. A hood is mandatory though. And I admit it's an acquired taste but once you learn to distinguish the look, you will always be able too. I keep the Jupiter for its softer drawing wide open and close up, while it's a very capable allround lens that is plenty sharp stopped down. Plus, it matches the camera just brilliantly, it's almost like those lenses were made with a black paint Leica in mind! The Heliar 50mm 2.0 in nickel is a story in itself. First, it's a very sharp lens. Its sibling the 3.5 was voted sharpest Leica mount lens ever after extensive testing by Popular Photography and this 2.0 version is no slouch either. It's a hefty lens, indicating (I think?) that it's all brass under the nickel. Plenty of brass shows in the helical and the hood it painted brass too. Even the matching rear cap is probably brass under its nickel coating. It handles like a dream. Focusing is smooth, stops are decisive, glass is brilliantly coated. It's a work of art and it produces astoundingly good images. 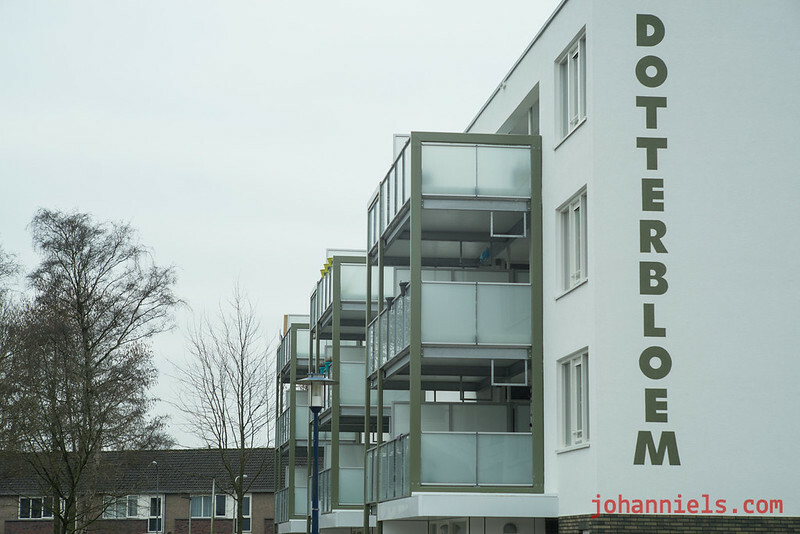 Again, the Jupiter lenses aren't regarded as very good lenses. 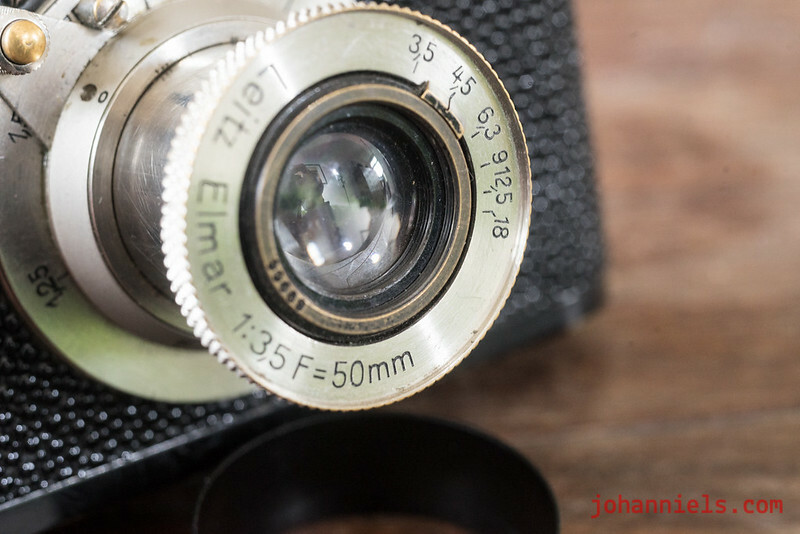 But, apart from the revival era of the Jupiter-8 in the 1990s, there is another era in which the lenses were very good and that is shortly after WWII. The Russians took stock of parts and lens elements, and even machinery and personnel from the Carl Zeiss plant at Jena, Germany as war damage repairs and re-located vital parts of the Jena factories to Kiev in the Ukraine. 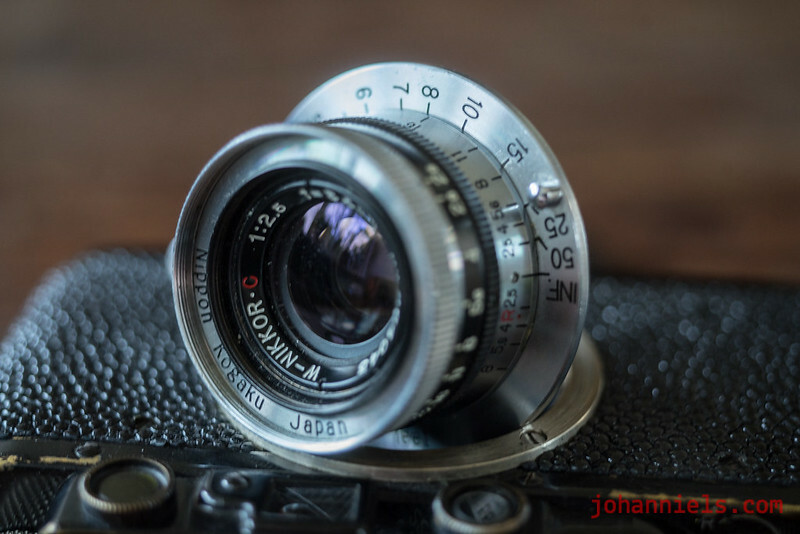 The earliest Jupiter lenses were solely constructed of Zeiss parts. 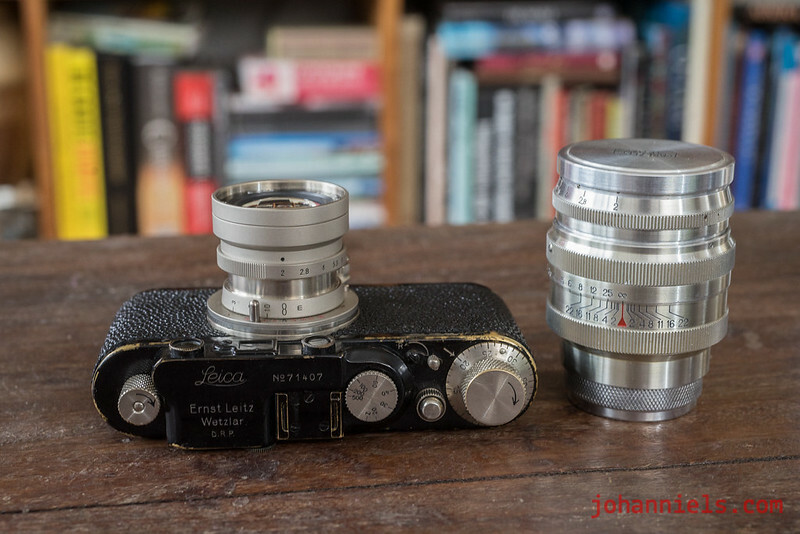 Those taken Zeiss parts were machined to match Leicas that were ordered by the German military during the war. The early Jupiters were assembled by Zeiss personnel or Russian personnel that was overseen by Zeiss instructors. Later on, the Russians re-designed the lens to match their FEDs, Zorkis and Kievs. Focusing then was based on the Contax standard and the later lens was re-designed altogether to focus close at 1.15 meters. 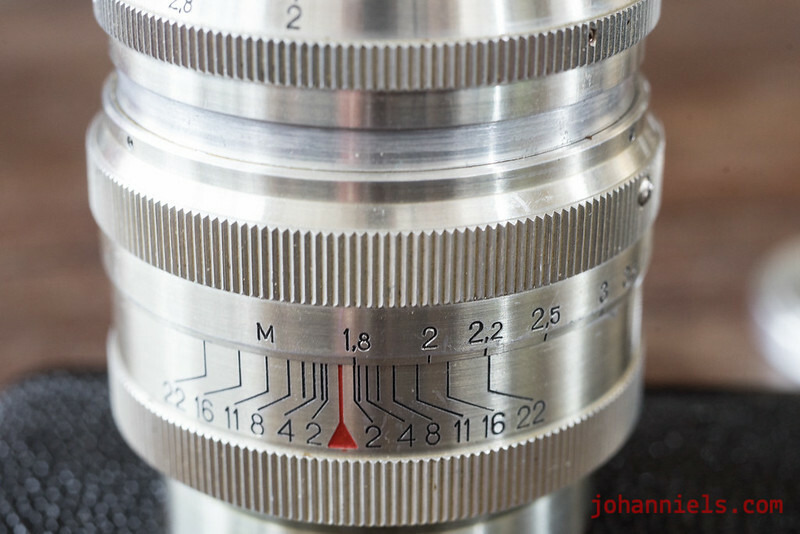 My 1952 Jupiter-9 85mm 2.0 is in LTM mount and has a few tell-tale marks signalling a Zeiss lens. It has the typical honey-and-a-purple-tinge hues of Zeiss coating, the screws in the barrel signal a Zeiss design, and the close focus is 1.8 meters. The Zeiss-originated Jupiter is quite a unicorn to locate. It is excellently sharp and renders nice pastel-like colors. Again, I used to own one and was foolish enough to sell it. The new owner stripped it and cleaned it, applied new grease and collimated it and after all that, it was even sharper than the example images I sent him prior to the sale! Non-original lens caps but they match the lens very nicely! The Zeiss-based Jupiter-9s have a nearest focusing distance of 1.8 meters. Also, the aperture index and the distance index don't line up on the early Jupiter-9 lenses, another tell-tale sign of the Zeiss elements inside. The Jupiter-9 85mm wide open, at 2.0. The Jupiter-9 85mm at 8.0. See how sharp the lens actually is in the center when you compare it to the 2.0 shot above? Remarkable! Jupiter-9 85mm at 2.0 and closest focus. Great bokeh! So there you have it. 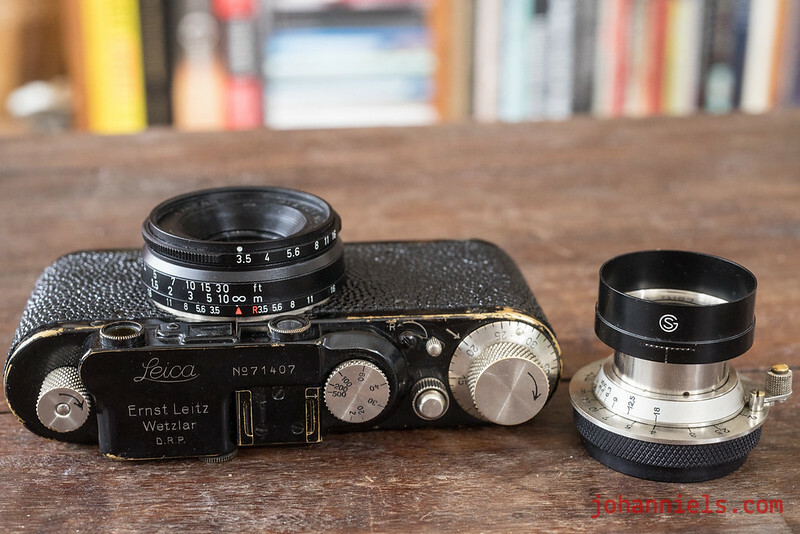 A loving write up of the seven lenses I own for my Leica II. Thanks for reading, welcome to bookmark, share and link to this article and my humble website!